What are the key challenges you face buying traffic with Apple? This is the question we ask when app publishers register for our All Things Apple Search Ads online conference (April 11-12, 2018), so I bet that your answer is achieving a low cost per acquisition (CPA). But, how low is low enough when it comes to this mobile app marketing metric? What costs per tap and install should you expect when working with Apple Search Ads? 7 storefronts: Australia, Canada, Mexico, New Zealand, Switzerland, UK and United States. In order to help you understand these numbers better and optimize your Apple Search Ads for the best results, we’re also sharing key factors that determine Apple Search Ads cost and – what’s even more important – our tips for improving your App Store Ads performance. Since in Apple Search Ads you’re paying for nothing but taps on your ads, let’s start with the average CPTs by categories. 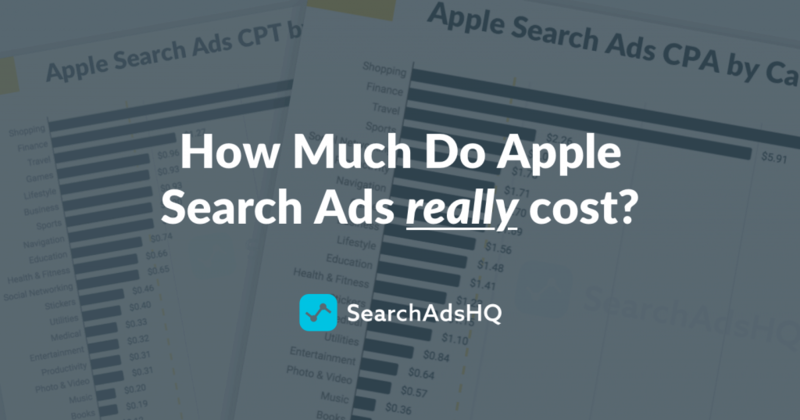 The average Cost per Tap of Apple Search Ads is about $0.84. Shopping and Finance are the most expensive categories with the average CPTs standing at $3.48 and $2.81 respectively. App Store’s most popular categories such as Games, Health, Lifestyle and Education follow heavyweights allowing app publishers to buy taps for around $1.00. Music, Books and Weather turn out to be the categories with the lowest competition and the lowest CPTs (so far). Surprisingly, Photo & Video is one of the cheapest categories in Apple Search Ads as well. Apple claims that you should target at $.50 buying taps, but if you work with photo/video apps, you can bid even lower and get taps for just $.30 CPT. Alright, since now we know the average Costs per Tap by categories, it’s time to learn another highly important mobile app marketing metric – how much you pay for one acquired user. Cost per Acquisition (CPA) is the mobile app marketing metric that indicates how much you pay for every “Get” button tap. In theory, the CPA would equal your cost per install (CPI). However, we can see from our statistics that the number of app page visitors who tap “Get” differs from the number of visitors who eventually install the app. Therefore, the actual CPI can be higher than CPA. To make sure no technical and behavioral issues stop users from installing an app and pump up your CPI, connect your app attribution system (AppsFlyer, Branch, Adjust, Kochava, TUNE, etc.) 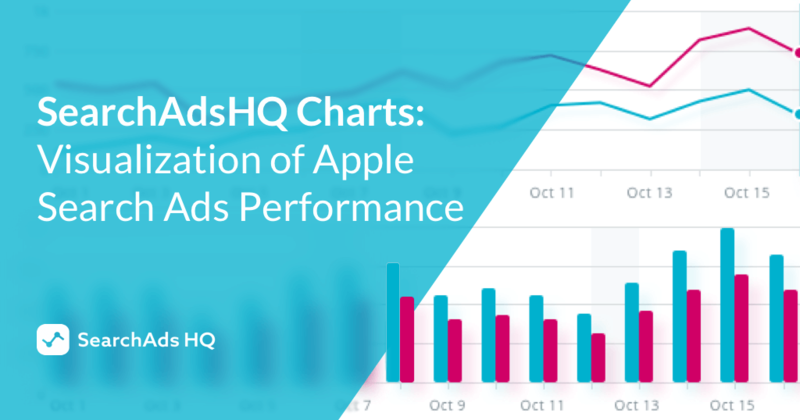 with SearchAdsHQ, an Apple Search Ads optimization platform, and see the App Store ads performance on all levels in one place. Shopping and Finance turn out to be the most popular yet expensive categories. For such applications, an average cost per acquisition is around $6.00. App publishers working in the Music, Books and Weather categories are to pay the lowest price – only about $0.30 per acquisition. Games, Health, Lifestyle and Education app publishers buy users within the App Store for around $1.50. If you look through the CPT and CPA tables once again, you will notice that a high CPT doesn’t necessarily turn into a high CPA. For example, Games have one of the highest CPTs, but the final cost per acquisition is lower than the average CPA across all categories. What makes such unequal distribution possible? This mismatch is predetermined with a conversion rate (CVR) of your app product page. When it comes to mobile app marketing metrics, a high CVR is decreasing the final cost per acquisition in one category, whilst a low CVR pumps up CPA in another one: people tap on ads but do not install. That’s why before app marketers start investing in Search Ads, it makes sense to optimize their product pages. Mobile A/B testing with SplitMetrics is one of the most efficient and trustworthy ways to do it. Only at perfecting all store page elements, app publishers are able to make the most of Apple Search Ads. The example of the Game category proves it. This app store segment is famous for its extreme competition which makes game publishers take care of their product page optimization. Thus, optimized store pages of games mitigate the impact of high CPT and favor effective Apple Search Ads activity. Is the average $1.76 Cost per Acquisition low or high? According to SplitMetrics, the traffic share of the first position in Search is around 19%. Early conversion experiments with Apple Search Ads had shown that average users didn’t understand that they deal with an ad and behaved like organic users would – providing a high tap-through rate. Thus, the highest TTR is observed in Business, Stickers, Lifestyle, Books and Health & Fitness categories, all average TTRs there are above 9%. So that means, running the App Store ads in these categories, you can expect 90 out of 1,000 people to click on your ads. The lowest TTRs are in the Medical, Shopping, Sports, Education and Social Networking categories where it barely reaches 5%. What are the reasons behind these figures? Well, according to TUNE, 90% of the top keywords refer to big companies and well-funded startups: Amazons, Facebooks, Googles, Sonys, and Netflixes of the world. That means the majority of the App Store searches is not about discovery. It’s about a means of accessing something specific. 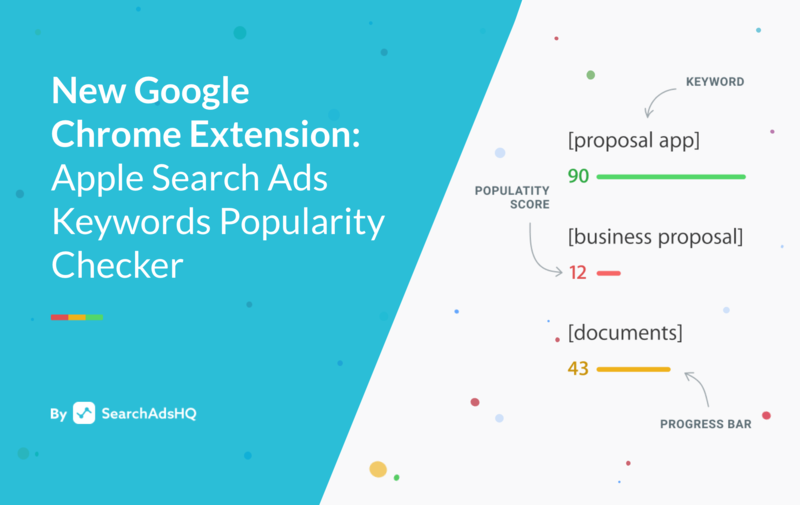 The more branded keywords you use for your ads, the lower TTR you’re likely to have. 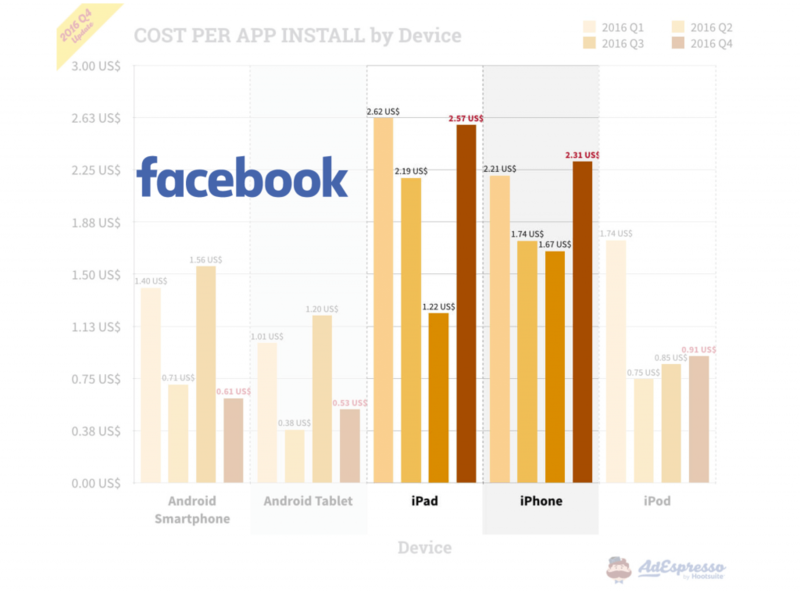 The short answer is, it is app publishers who determine costs. Apple Search Ads functions on an auction basis, which means that the price you pay for a tap is the bid of your closest competitor + $0.01. Besides, the relevance score of Apple Search Ads ensures you compete only with relevant applications. Moreover, it is likely that these applications will be from the same category and weight class as your app. This way, Apple eliminates CPT bid peaks and provides all conditions for fair competition. It should definitely become a part of your mobile app marketing strategy. 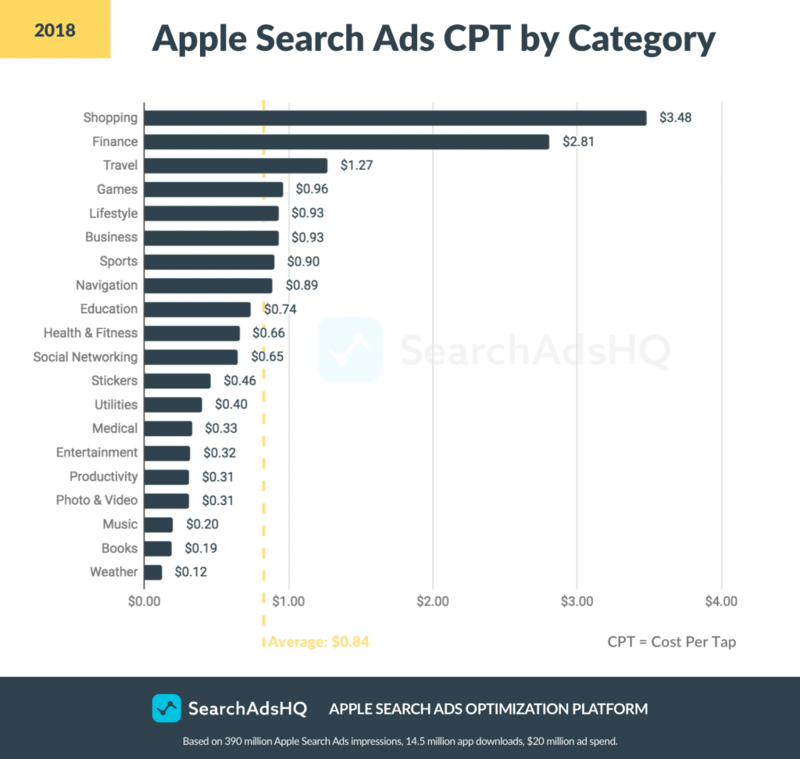 Before joining a big auction and competing with other advertisers on Apple Search Ads, it might be also great to look at key factors that determine Apple Search Ads costs and learn how to adjust the CPT you’re getting to your mobile app marketing goals. Conversion (the most important factor of all). Whether app store users who tap on your ad convert into installs? Keywords competitiveness. Two elements that influence competition are keyword relevancy and volume. Targeting. Apple Search Ads campaigns targeted at different audiences will have different CPTs. Scheduling. Apple Search Ads costs may vary depending on weekday and time. Relevance. Trying to run ads for the keywords irrelevant to your app is useless. The most effective and sensible decision is to start with conversion optimization. Thus, you’ll be able to reduce cost without loss of traffic volume. App store optimization efforts should be focused on both click-to-installs and clicks on the banner. Try to work with less competitive keywords. 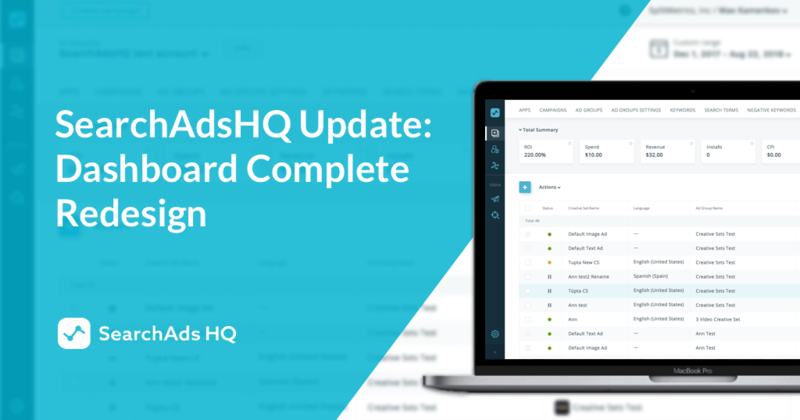 You’ll be able to run campaigns for the same price using a greater number of keywords with lower bids. Providing you nail cheaper relevant keywords, your Search Ads activity won’t suffer any decrease in traffic volume. Make use of relevant long-tail keywords. Such keywords represent a less competitive segment and provide you with views from users that are more likely to convert. Mind that it’s always better to be in top 10 results for a keyword with average search volume than rank low on an extremely popular one. The same logic can be applied to your Apple Search Ads activity. Search term optimization and work with negative keywords in particular. Add super expensive and competitive keywords which merely eat away at your budget to negative ones. However, mind that this method can lead to certain traffic volume reduction. You can try to play around with scheduling. Pausing ads for certain weekdays or times of the day, you may save a good deal of mobile app marketing budget and spend it later in a more efficient manner. Nevertheless, one should bу sensible with this method. SearchAdsHQ cohorts and automated rules are of great help here. Experiment with your bids and targeting and try to figure out optimal price for your keywords. 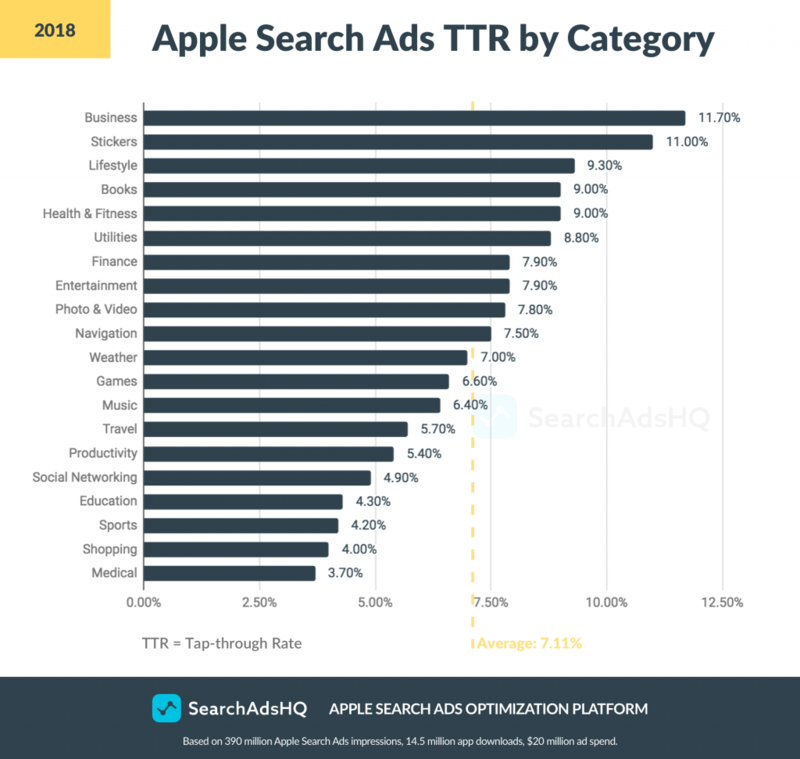 The most important thing to remember about the optimization of Apple Search Ads is that performance improvement is impossible without reaching the balance between cost and efficiency. This balance isn’t always easy to reach but the result undoubtedly worth the effort.